While it may seem like a one-trick pony, a sit-up bench is actually a very versatile piece of exercise equipment. Use it to strengthen multiple unique muscle groups, both in the abdomen and throughout the body. Many different exercises can be performed on a sit-up bench to give you an effective workout. This exercise strengthens the erector spinae muscles that help extend the back and provide stability to the spine. How To: Lie on your stomach with your knees bent around the end of the bench to secure them. Put your hands on the back of your head and lift your upper body off the bench until it is parallel with the floor. Hold this position for 1 to 2 seconds and then slowly lower back down. Russian Twists strengthen the oblique abdominal muscles on the sides of your stomach. These muscles assist with flexing, side-bending and rotating the trunk. How To: Fasten your knees on the end of the bench and lie on your back. Lock your hands behind your head and perform a sit up. As you do this, rotate your right arm towards your left knee. After a 1 to 2 second hold, straighten your body and lower it back down to the bench. Repeat with the left arm moving towards the right knee. 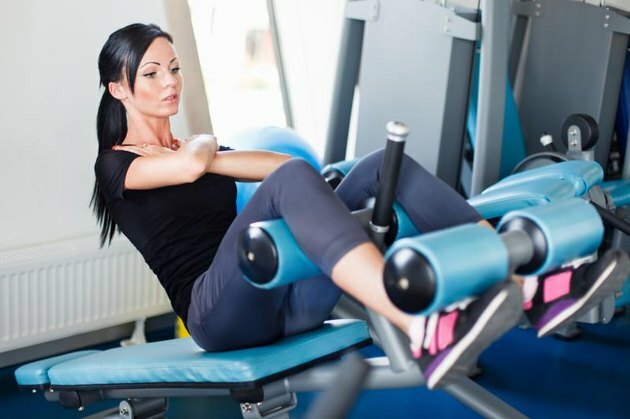 Read More: How Many Minutes for Abdominal Workouts Per Day? This exercise activates your pectoralis major. This muscle, the bulkiest in the chest, provides stability to the front part of the shoulder joint. How To: Lie on your back with your knees secured in the sit-up bench rollers. Holding a dumbbell in each hand, bring your arms out to shoulder level and bend both elbows to 90-degree angles. Then, extend your elbows and push the weights straight up in the air and slowly back down again. Crunches target the rectus abdominis, a long and flat muscle in the front of your stomach that helps to flex your spine. How To: While lying on your back on a bench with your knees secure, clasp your hands behind your head. Slowly lift your spine off the bench one level at a time as you sit up. Make sure not to strain your neck while doing this. When you get to the point where you are sitting vertically, slowly lower back down to the bench again. This exercise strengthens your transversus abdominis, a muscle deep in your core that gives stability to the spine. How To: With your head at the top of a sit-up bench and your wrists secured on the end pads, lift both legs simultaneously until they make a 90 degree angle with your torso. Hold the legs here for 1 to 2 seconds and then lower them down to the bench again. Make sure to keep breathing while you complete the lifts. Push-ups strengthen your chest muscles, including the pectoralis major and pectoralis minor. How To: Keep your elbows straight and place your hands on the upper portion of a sit-up bench. Lean your body weight onto your hands and rise up onto your toes. Slowly bend your elbows and lower your chest until it lightly grazes the bench. After a 1 to 2 second hold, extend your elbows and push back to the initial position.